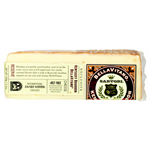 Unique Parmesan flavor and creamy Cheddar texture of this signature cheese, BellaVitano! Pasteurized cows milk soaked in New Glarus Raspberry Tart Ale. Proscuitto is the Italian word for ham. 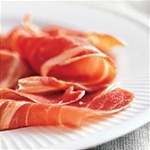 In English, the term prosciutto is almost always used for a dry-cured ham that is usually sliced thinly. This specific Prosciutto is made in the United States using very high standards. It has All-natural ingredients that are aged for nine to fifteen months.The process is lengthy but it ensures that every slice has a consistently sweet - never too salty - flavor and a delicate, pink color. Sartori's most requested cheese, BellaVitano combines the rich and creamy flavor of a young Cheddar cheese with the savory, crystalline crunch of a premium aged Parmesan. Rubbed on the outside with balsamic vinegar. 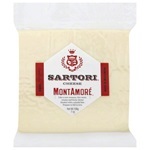 MontAmore is a Parmesan inspired cheese made by Sartori Cheese Company at their farm in Wisconsin, United States. This cow's milk cheese is named after the Dolomite Mountains that provide a gorgeous backdrop for Sartori's hometown of Valdastico, Italy. It is a sweet, creamy and fruity cheese with hints of pineapple and tropical fruits balanced by playful, tangy bite on the finish. Bresaola is a air-dried, salted beef that has been aged three months until it hardens and turns a dark red, purplish color. 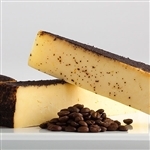 This American Original is hand-rubbed with the “Beehive Blend” from Colorado Legacy Coffee Company, which is the cheesemakers’ brother. Lavender buds are ground with the coffee. The rub imparts notes of butterscotch and caramel, which are prevalent near the rind, but find their way to the center of the cheese. This is a full-bodied cheese with a nutty flavor and smooth texture. 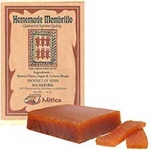 Quince Paste is a Spanish delicacy, also known as Membrillo. Quince is a relative of the apple and pear, with honey and vanilla overtones. This paste is similar to a thick jam, slightly sweet with the inherent tartness of the quince coming through. Paired with a Manchego or blue cheese, Quince Paste truly shines. Brighten up any cheese plate today with this delectable accompaniment. A cross between blue gorgonzola and camembert, this triple-cream made from cow's milk cheese is soft and creay with a powdery rind. Made in Germany! Farm-style summer sausage featuring lean beef and pork coarsely ground, spiced to perfection. Crafted in the European tradition this semi-dried summer sausage is slowly smoked for days over hickory slabs. The result is a distinctive tangy flavor. Convenient 12 oz. small diameter (bias cut) piece that is perfect for snacking.